In 1998 came a new chapter in the band’s brand of Texas schizo rock. Again on Germany’s September Gurls records but this time as a sextet. With the added keyboards from Flip Osman and the Saxophone and 3rd guitar antics of Charlie Naked the band had reached a new high of madness. The CD has something for everyone, Blue Cheer type cheeze riffs, Hawkwind space sorties, Sci-fi epics, garage rock sludge, sensitive 60 pop, insane pompous histrionic guitar solos, a gratuitous “secret bonus improv lo-fi track”, trippy mellow jams, Beefheartian skronk, etc. etc..
Hendrix’s Boots – The title of this song suggests that “We Are Not Worthy” to kiss Hendrix’s boots, which is really kind of gratuitous as we make that point abundantly clear in the song itself. The actual lyrics are about a woman just wearing you out, in every sense of the word.The entire session was fueled by beer and herb and this first track sets the mood with a Doors-like raga interplay between Ramon Medina and Clinton Heider punctuated with heavy Larry Liska powered crescendos. Monkey – Here is the obligatory garage number. Clinton was really hitting his bug, primate, and drug lyrical peak with this album and this song emphasizes the second ingredient of the mixture. You cannot hide the monkey inside, you suit wearing mother-fucker! Notes: This song includes cowbell. James Hartman – Geeky friend of Ramon when he was growing up in Clear Lake. His geek powers at one point reached a critical mass which resulted in him collapsing under the weight of many ELO albums. Beer, Women, and Sunflower Seeds – A Clinton Heider song that graduallyhad more and more little bits added. There has always been an unspoken pirate element to this sing that occasionally expresses it self in chants of “Yo Ho Ho” after the chorus. We can’t explain it but I’m sure that this is the kind of thing that Pirates would sing along the barbary Coast. 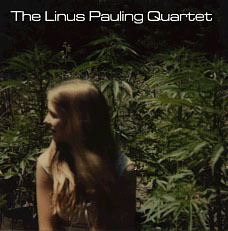 The Colour Out Of Space – This is probably the high peak of Linus pot songs. The band Channels Hawkwind, Pink Floyd, A touch of Robby Kreiger, Black Sabbath’s into the Void, HP Lovecraft and Opens the doors of perception! This is part of the never completed Pot Opus. The narrative takes place on the doomed planet where the Linus Mournebong Mythos begins. Interstellar Absolute Power Bootycall – A jam centered around a riff by Ramon. This is supposed to represent the flight of the Bong Planet spaceship across the galaxy. Dance of the Bugpeople – Originally released in demo form in the Untitled Alien LP, this is the full studio version. This concerns the attack of the bugpeople who terrorized the elders who colonized the new planet known as Earth. Insomnia – This is a song penned by Steve. La Morte de “Les Amis” – I can’t recall who the author was or whether this was a group thing. (I think this was mostly a clinton and ramon song) Les Amis was a very good little restaurant in Austin that sadly closed roughly around the time of this release. If you buy Richard Linklater’s Criterion Edition of Slacker you will not they they included a 10-Minute trailer for a film called “Viva Les Amis” by Nancy Higgins – a documentary on the loss of cool unique places in Austin to “revitalization” in the 90’s which brought generic and ubiquitous corporate stores and chains. Artist Mary Doerr [http://www.images-austin.com/calendar5.html] has a painting of the restaurant on her website – It’s September in the calendar. Cole Porter I – (Unlisted Bonus Track) – a prelude to “Ashes in the Bong of God”. This Bonus track is totally improvised and any attempts to recreate it lacked any force that the original had. Thus we put it as a bonus track as it was kind of outside the Album, plus it’s kind of fun to surprise people. and, just for balance, here’s the one negative review we’ve received.